Let’s list out 7 best beaches to visit in Albania: Jale Beach Snuggled in the Albanian Riviera is the sequestered shore of Jale. This beach is a wonderful idea to explore if you're looking for a beach escape from your busy city streets. There's nothing more to do than relax! It's not too far from the hillside village of Vuno, if you're trying to go to a standard Albanian village. Mirror Beach (Pasqyra) Located far from popular Ksamil is this amazing beach. I would recommend your visit to this beach, as it is one of the most quietest and amusing beach in the country. In the afternoon you'll have waves, which are always enjoyable and uncommon on Albania beaches. Monastery Beach If you're visiting the Southern side of Saranda, you have to make a quick trip to the Monastery shore. It is not far from the city, on the road to the beach that is the popular town of Ksamil. You also have the option to walk up which I highly advise; if you would like to acquire views of Saranda and the shore. Drymades Beach A 10-minute drive away from Dhermi village, a popular beach getaway destination in the Albanian Riviera, is Drymades -- one of my own favorites! This long stretch of beach is very beautiful. You have the option to stay in one of those seaside accommodation options like the Hildon Eco lodge, or it is possible to camp on the ground referred to as the Sea Turtle which is on the shore! of the most secluded beaches in all Albania making it likely the most beautiful. I highly suggest seeing with the Llogara National Park while you're in the region. Shpella Beach At the area of Lukove is just one of the finest Albania beaches near the city of Saranda! If you wish to escape from the tourists in Saranda, this beach is perfect and there are tons of places for camping! Livadhi Beach From the tiny seaside town is my opinion, the best beach in Himara. It's very quiet and beautiful in comparison with the other parts of the country. Nevertheless you still are so close to the town of Himara, in case you require a bit of action! The beach is beautiful with plenty of space for you to put sunbed or just casually sit. 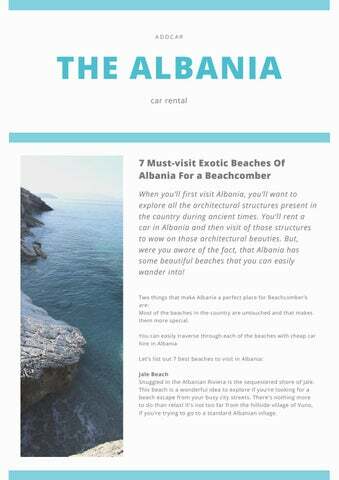 addCar: 7 Must-visit Exotic Beaches Of Albania For a Beachcomber!